The Boston Rock Gym Offers Summer Programs for Kids! WHAT: Boston Rock Gym (BRG) located in Woburn, MA is offering summer programs led by expert climbers in small groups to ensure safety and instill a spirit of cooperation and teamwork amongst students. From June 25th to August 31st, 2012, kids ages 10 and up will have an opportunity for an unforgettable week of all-day climbing adventures with the BRG’s Outdoor Climbing Camp, where they will travel to some of the most abundant climbing destinations in New England with the area’s most accomplished rock climbing professionals. BRG also offers daily two-hour Kids Climb Classes where experienced instructors will belay children and encourage them to advance their skills. 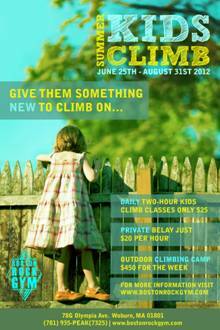 Kids Climb Classes are offered Monday-Friday from June 25th to August 31st, 2012 with 3 sessions daily from 10:30AM-12:30PM, 1:00PM-3:00PM and 3:30PM-5:30PM with the option to sign up for more than one session per day. For those wishing to have a more personal experience, Private Belays are available for only $20 per hour. This gives children the opportunity to learn in a more intimate setting and have more one-on-one support throughout the learning process. Discounted prices for private belays are available for scouting groups, school groups and non-profits. Reservations for all Kids Climb Classes and Private Belays must be made at least 24 hours in advance by calling The Boston Rock Gym at (781)935-7325. COST: Outdoor Climbing Camp: $450 per week per child or $400 for annual BRG members (extended day: $100 per week until 5:30PM); Kids Climb Classes: $25 per session; Private Belays: $20 per hour, 2 hour minimum with special discounted pricing for scouting groups, school groups and non-profits (discounted rate if signing up for multiple classes). RSVP: Reservations must be made at least 24 hours in advance. Please call the Boston Rock Gym directly at (781) 935-7325 to sign up. The Boston Rock Gym is New England’s premier indoor rock gym, offering the best in climbing terrain and instruction at their state-of-the-art rock gym located just outside of Boston in Woburn, Massachusetts. The second oldest rock gym in the United States, Boston Rock Gym offers group and individual lessons, technique classes for beginner to advanced climbers, various levels of membership, climbing competitions, outdoor excursions, equipment demos, youth programs, team building, corporate and special events, birthday parties and gift certificates. An industry leader in certified instructors and outdoor educators, the Boston Rock Gym staff helped to pioneer the Rock Wall Instructor Certification Course with The Climbing Wall Association and The American Mountain Guide Association, and nearly all team members are certified Rock Wall Instructors. The Boston Rock Gym is located at 78 Olympia Avenue Woburn, MA 01801. Hours are Monday-Friday: 12PM to 10PM, Saturday: 10AM to 10PM and Sunday: 10AM to 6PM. For more information call (781) 935-7325 or visit www.bostonrockgym.com.